We have done it! 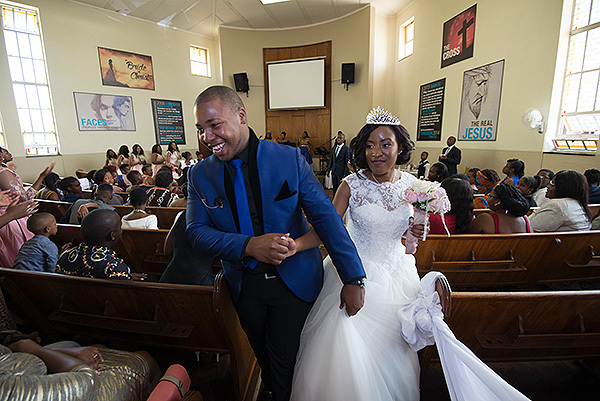 In December 2017 two of the Africa Media Online team tied the knot and got married in fine style at Grace Generation church in Pietermaritzburg – a first for Africa Media Online. Nkanyiso Ngcobo takes hold of his wife, Sanelisiwe Ngcobo (nee Nxumalo) at their “white” wedding ceremony. Nkanyiso Ngcobo as been part of the Africa Media Online digitisation team for many years having grown up in Pietermaritzburg. He was part of the original team that traveled to the Eastern Cape ahead of the ANC centenary celebration to digitise a select number of manuscripts and photographic images in 2011. Over the years he has gained significant experience in digitisation and he has a gift for dealing with technical systems and so during the course of running a new project digitising the ANC Archive at the University of Fort Hare (UFH) from November 2016 to the end of March 2018, Nkanyiso took over the responsibility of technical leader on the team. 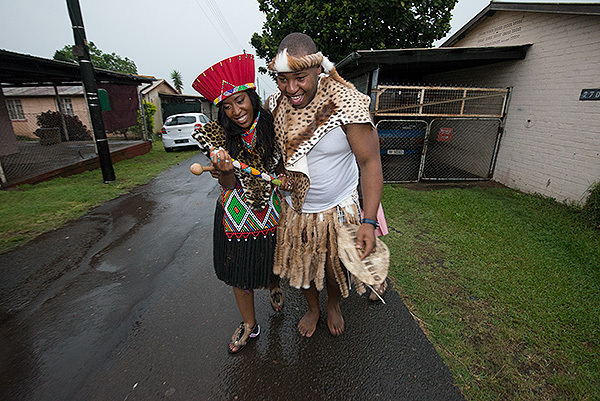 Nkanyiso Ngcobo had to chase and catch Nelly before she escaped during the course of their traditional Zulu ceremony. Sanelisiwe Nxumalo joined the team that was itemizing the ANC Archive down at the University of Fort Hare in 2016. Finding that the ANC Archive had been ordered to the folder level but not to the item level, we needed to grow the team from 6 to 14 people and Nelly, who had just started assisting us at head office in Pietermaritzburg with metadata capture, was one of those relocated to UFH. It was not long before Nkanyiso came to speak to me about his interest in Nelly and he did well to save up for the wedding, travel to KZN for lobolo negotiations in the latter half of 2017 and finally marry her on the 30th of December 2017. All of us at Africa Media Online wish Nkas and Nelly a long, happy and fruitful marriage!